Tri-X Filters are gaining in popularity due to their unique ceramic design which allows it to filter twice as much as a standard paper filter. They have a life expectancy of 5 years with proper maintenance. They are able to be used as a direct replacement for all paper/fabric filter cartridges on Hot Spring Highlife Models from 1997 to current. Even if it originally came with a different filter. This filter comes standard on current Hot Spring Models: Grandee, Vista, Envoy and Aria. This filter has amazing abilities, however it's ceramic design raises the questions of how to clean it and how often to clean it. The good news is that cleaning tri-x filters is no different than cleaning any other filter with the exception it can be rinsed in a dishwasher. You can clean it the same way or you can use a dishwasher to help speed the cleaning process (unless your spa is using Baqua Spa water care products). Before we go into how to clean the filters we should discuss how often the filters should be cleaned. Tri-x filters should be cleaned regularly to maintain water clarity. How regularly will depend on the frequency and duration of the hot tub's use and the number of people who get in. Getting in with lotions or cosmetics will increase how often the filters will need to be cleaned. How much dust, dirt, leafs etc that get in when the cover is open will also have an impact. All of these things contribute to determining the appropriate time between filter cleanings. Typically, a filter should be sprayed off with a garden hose to remove the leafs and dirt on it one or two times a month with additional rinsing as needed. The alternative cleaning for a Tri-X filter is to put it in a dishwasher once a month and use a hose as needed. If it is not yet time to use filter cleaner after spraying off the filter it can go back in the spa. The second part of cleaning the filter is removing the oils from the filter that come from skin, lotions, or cosmetics that will eventually clog up the filter's pores and prevent proper filtration. This also removes mineral buildup from the water. This should be done at least once a month with either a spray on or submersion filter cleaner and should be done after either spraying with a garden hose or washing in the dish washer. The two steps of the cleaning process are discussed in greater detail below. 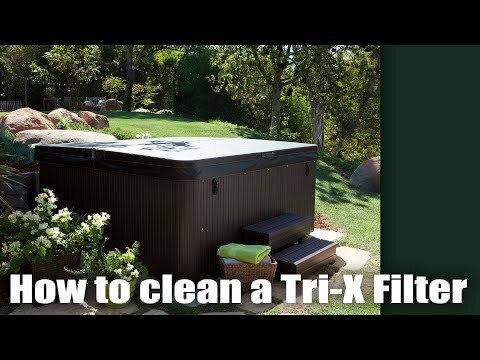 If you are unfamiliar with how to remove filters from a Hotspring Highlife spa, at the bottom of this page are instructions on how to take the filters out of your spas and put them back in. When using Brilliance for Spas Spray and Rinse Filter Cleaner, saturate the filter with water and spray cleaner over total surface area for maximum effect. Wait 6 minutes then rinse filter thoroughly with hose. Repeat treatment may be required for heavily soiled filters. If using Baquaspa water care products you must use Baquaspa filter cleaner. When using Brilliance for Spas Filter Cleaner, simply soak the filter in the de-greaser according to the package directions, then place the filter on a clean surface and spray until clean, using a garden hose. WARNING: Do not use the spa with the filter cartridges, or standpipe(s) removed as debris floating in the spa could accidentally get into the spas plumbing. The diagram in the section below shows the filter components mentioned in this section. Turn off power to tub. Unscrew the filter cap (located on the top of the filter standpipe). Note: Do not remove the filter standpipe while removing the cap. If the standpipe is accidentally unscrewed while removing the filter cap, immediately separate the two components and reinstall the standpipe. Standpipes should never be removed while water is in the spas as objects could get into the plumbing. To reinstall the filters, reverse steps 1 to 3. You may replace the Tri-X onto the standpipes with either side facing up. unscrewed during the next filter removal.